We know that dental implants can transform your life. Implants are designed to replace the gap in your smile with a natural tooth. In some cases if multiple implants are used, you can replace all of your teeth in a procedure referred to as “All-on-4”. So now you can now have an artificial tooth that looks natural and functions like a natural tooth. EXTRACTION WITHOUT BONE GRAFTING. This is the reason why we ALWAYS tell patients that if you are going to have a tooth extracted AND are thinking of replacing it with an implant ALWAYS ask about bone grafting. Do not let anyone remove your tooth without bone grafting. To us it does not matter who does the extraction + bone grafting, we just want you to have enough bone, just in case you decide to have an implant in the future. SUBOPTIMAL BONE GRAFTING. Sometimes we have patients that are referred to us for implants after having their tooth extracted + bone grafting by other practitioners. Unfortunately, despite the bone grafting there is still not enough bone to place an implant. This can sometimes be because of the following: inadequate/incorrect bone grafting material, lack of exposure at the site, lack of securing the bone grafting material and lack of isolation. A bone grafted site almost always needs to have three vital materials: the right bone grafting material, the isolation of the site using a “membrane” and closure of the site with sutures. This is why anytime you have a bone grafting procedure you are quoted for “bone grafting” (there are many different types of bone grafting) and some sort of “membrane” (there are many different types of membranes). An extended period of time between the time of extraction and the implant placement. When a tooth is lost or extracted the underlying bone undergoes remodeling. Over the years the underlying bone will shrink, causing a lack of bone at the site of the missing tooth for an implant placement. Additionally, if there is an infection around a tooth, which is usually the case, then infection will also destroy the underlying bone. The most common area that we see is at the first molar site, usually referred to as the “6th year molar” because these teeth come in around the age of 6 and are exposed to all the candy, soda and all the detrimental agents that cause cavities on our teeth. This is the most commonly extracted tooth in adults. When a patient presents to us for an implant, we usually obtain an xray first, to determine if there is enough bone to place an implant. The most common xray is a “panorex” a panoramic xray that allows us to see the vital structure in your face (sinuses, nerves, arteries…). This xray is different from what is obtains at your general dental office, usually referred to as a “PA” this xray will only show your teeth and not the surrounding bone and vital structures. Subsequently, if there are any questions about the adequacy of the bone on the panorex, (especially in the width dimension), then a CBCT may be obtained in our office to visualize the site in 3-dimensions. 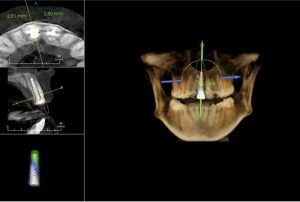 Unlike most dental offices, we have a special softwares in our office that allows us to virtually perform you implant surgery using the CBCT data = “virtual implant surgery” even before going into surgery. This allows us to measure the needed distances so sub-millimeter accuracies and to show you exacting what is and what is not possible, with or without bone grafting. As mentioned earlier, it is not uncommon for people who are missing a tooth to have bone loss at the site of the missing tooth. Over the years, when a tooth is missing, the body starts to reabsorb the jaw. 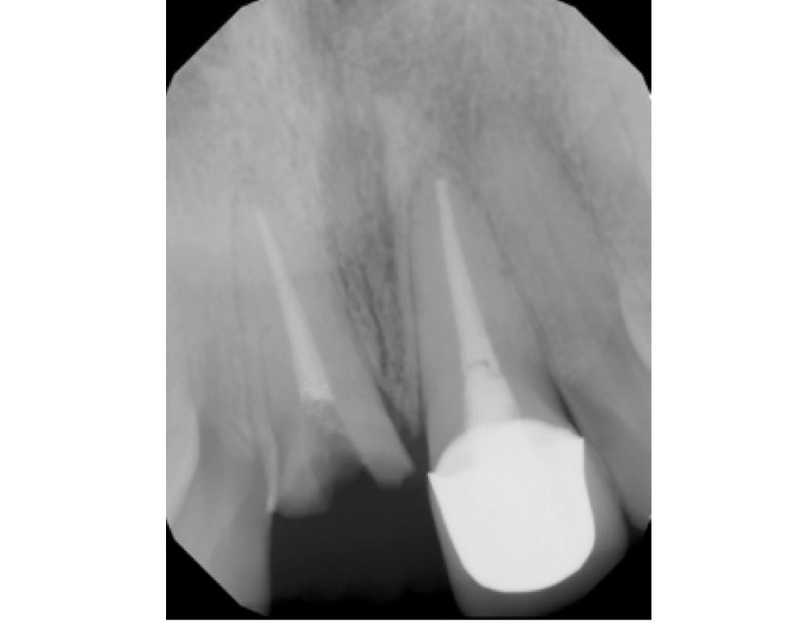 We need at least 2mm of bone all the way around the implant. Since the smallest implant that is manufactured is 3.0mm, we need at least 2mm + 3mm implant + 2mm of bone to place an implant. That means you need to have at least 7mm of width at the site of your missing tooth for an implant. Additionally you need to have a minimum of 2mm distance between natural teeth and an implant. Meaning that you need a 7mm distance between your missing teeth in order to have an implant. If this space is not there, then you will need to undergo orthodontics to open up 7mm of space before an implant is placed – we have many patients that have to do this especially if they have never had orthodontics in their childhood. This is why it is highly recommended that you replace a missing tooth between other teeth, before the adjacent teeth shift into that space. Over time, if there is not enough around the implant, the implant surgery may fail. This is another common phenomenon seen in our office, where patients are referred to us for implants that are failing and need to be removed. It is much hard to remove and implant then to replace it! Let’s say that we have determined that there is not enough bone for an implant and that bone grafting is required before any implant placement. Bone grafting comes in many forms. It can be synthetic, from other animals, humans, stem cells or from yourself. The basic makeup of all these materials is calcium. By providing this additional material at the site of the missing tooth, your bodies bone cells (osteoblasts) will use this added calcium to create new and more bone at the site. Afterward, it usually takes a few months for the grafted material to be strong enough to place an implant into the newly generated bone. This is why X-rays are taken a few months after the bone grafting procedure to visualize what has happened at the bone grafting site. If the X-rays show that the bone density at the site is suboptimal, then more time will be required for the bone to regenerate and re-calcify before placing the implant. In all of our locations in San Francisco and Cupertino, we recognize bone grafting is sometimes a necessary first step toward a successful dental implant. Call us today for a consultation to find out more about your bone grafting options.